ST. AUGUSTINE, Fla. (Feb. 20, 2015) – A National Guard Soldier will be featured on a nationally televised sport-fishing show this month, representing citizen-Soldiers everywhere as he reels in bass, sailfish and even an alligator. Maj. Peter Jennison of the Florida Army National Guard’s Recruiting and Retention Battalion, along with his son Morgan, will appear on a pre-taped episode of NBC Sports’ show “Bass 2 Billfish with Peter Miller” on Feb. 25 and March 4. The reality fishing show with professional angler Peter Miller is filmed in locations across Florida. Jennison’s two-day episode shot in late January included salt-water fishing for sailfish off of the coast of Miami Beach, and freshwater bass fishing deep in the Florida everglades. 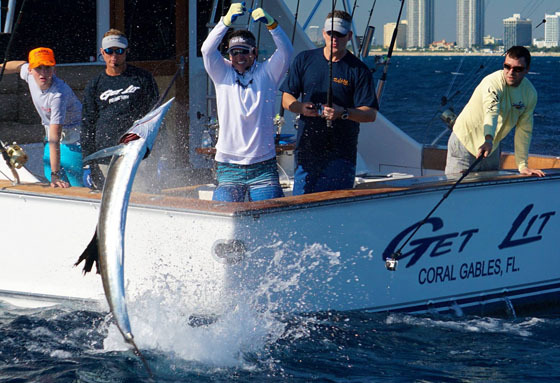 Jennison said he and his son caught seven sailfish during the salt-water portion of the episode – which broke the show’s previous one-day record of five sailfish caught – and they also reeled in two sharks. The crew released the sailfish and the sharks, but kept three mahi fish for dinner that night. On the second day they caught more than 50 fish in the expansive everglades, including bass, brim, oscar, mudfish, crappie, and gar. Miller and his crew are the three-time World Sailfish Champions and are considered one of the top sailfish teams in South Florida. The first part of this “Bass 2 Billfish” episode will air on NBC Sports Outdoors on Feb. 25 at 2:30 p.m. EST, with a replay on Feb. 26 at noon. The second part of the episode will be shown March 4, 2:30 p.m. EST. Encore presentations of both episodes will air at later dates on NBCSN. More info on the show can be found on www.Bass2billfish.com or its official YouTube channel at www.youtube.com/Bass2Billfish.